It Only Happens Here – Not in Canada, Not in England, Not Anywhere Else – When is Enough – Enough? You are here: Home / News and Updates / It Only Happens Here – Not in Canada, Not in England, Not Anywhere Else – When is Enough – Enough? The Marjory Stoneman Douglas shooting is the 18 – 18 th – mass shooting in the US this year – AND the date is February 15th. We are less than 47 days into 2018!!! 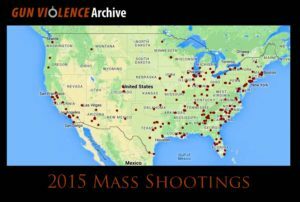 In 2017, as of October 2, according to data from the Gun Violence Archive, a total of 273 mass shooting incidents occurred. My three sons went to Marjory Stoneman Douglas. I have nothing but great things to say about this high school. The teachers were marvelous, dedicated, and caring, and the students some of the best and the brightest. The parents concerned and supportive. Shootings like this, whether we like it or not, only happen here – in the United States of America. Yes, guns don’t kill, people do. But, guess what – pistols don’t kill AR-15s do! The nation’s mass-shooting problem is mushrooming. And the latest, most serious shootings all seem to have one new thing in common: the AR-15 semi-automatic assault rifle. Why, why is the NRA so opposed to these mass-killing guns being available to the worst of us? It’s time, call your senator, your congressman, and speak out!